My bag is brimming with library goodness tonight! We showed off the ultra modern, neighborhood branch to our guest. Unbeknownst to us, we arrived just in time for a performance of The Stonecutter by the Puppet Truck. It was great! Then, I had an extra pair of hands to help me carry the 14 books on hold JUST FOR ME! As I placed them here and there around the house (you never know where you'll be nursing! ), I had to grab the camera. My copy of House Beautiful's Decorating With Books was being used to decorate the end table. More on that one later. I can't wait to see more of your decorating with books. If that is one thing I have...it's books! I like their Decorating with Houseplants book, too. 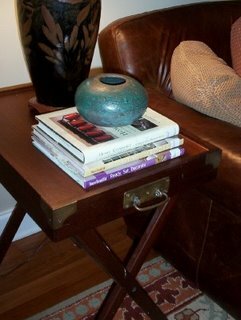 Once when I was a dirt poor book store owner my coffee table was a huge stack of coffee table books with a glass top. I also wallpapered a room with pages out of some old encyclopedias, it was beautiful, I loved that room. If you like decorating with books read At Home With Books. You'll be impressed if not inspired. Bless you for your love of books. Wow, so all those piles of books in my living room and den are "docoration"! Wait, piles on the floor don't count? Waiting for someone to build the bookshelf isn't an excuse? Clutter, you say? Thank you, Barb. That's quite a compliment. Mothersong, I'm waiting on my bookcases, too. Husband said maybe over the holiday break, but not in time to get stockings hung on the mantel. Maybe I can hang them on stacks of books instead?